Alpina Burkard Bovensiepen GmbH started turning BMW's 3-series into their own hot-rod corner-carver back in the 1970s with the E21. Technically, the Alpina conversions generate their own VIN number (similar to US based Saleen) and Alpina is considered an auto manufacturer, but they use a basic high volume donor car to create something special...consider them a less shady version of your common tuner. Find this 1982 Alpina C1 2.3 found here on eBay current bidding for $7,100 reserve-not-met with 4 days to go, located in Yokohama, Japan. 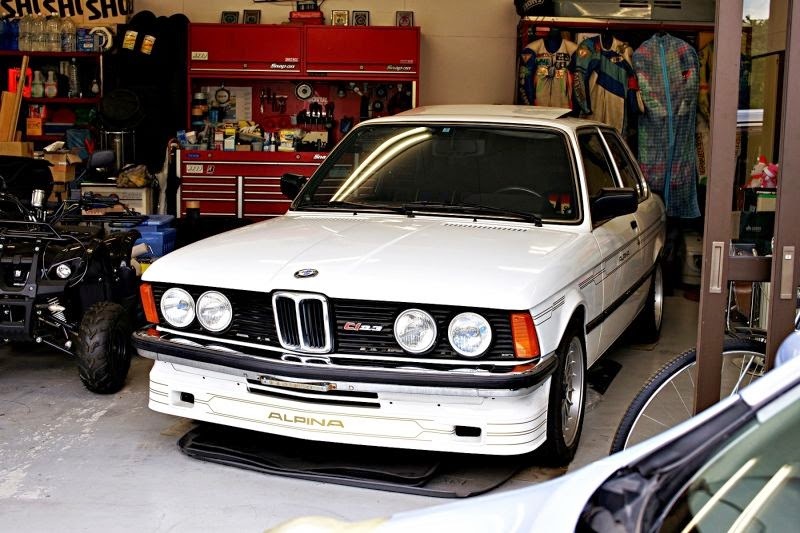 Today, Alpina is more than just your local speed shop run by that big sweaty guy, but back in the day it was a small operation. According to bmwism.com they only produced 462 examples of the C1 2.3 cars for the 1980-1983 model years. Power in the C1 2.3 comes from an Alpina juiced 2.3 liter version of BMWs M20 inline-6, that was rated at 168 horsepower and 150 ft-lbs of torque. The standard BMW M20 only put out 137 horsepower, so the C1 was the closest thing to an ///M car you could find before the E30 factory M3. The sporty steering wheel and clown seats can be easily adapted to, but the slushbox has got to go -- luckily there are plenty of BMW 5-speed gearboxes ripe for picking from your local junkyard that will bolt right up to this engine. Don't forget the clutch pedal, smaller brake pedal, and associated hydraulic clutch parts as well. You have to find a 5-speed from another M20-equipped E21 or E12 for a direct bolt-on. Unfortunately, in the USA these are very hard to find. The trans from the M10 E21s don't fit, and those from M20-equipped E30s require you to replace your speedometer and craft an interface plate to fit. In other words, it's a total pain. Also, power should be 170hp in these, up from 143hp in the stock 323i. The 137hp figure comes from the early E30 323i, which had L-jet while these have K-jet. That steering wheel is a Alpina-installed Momo model and is correct for this model. Those seats aren't, even though someone tried to replicate the Alpina upholstery on them. 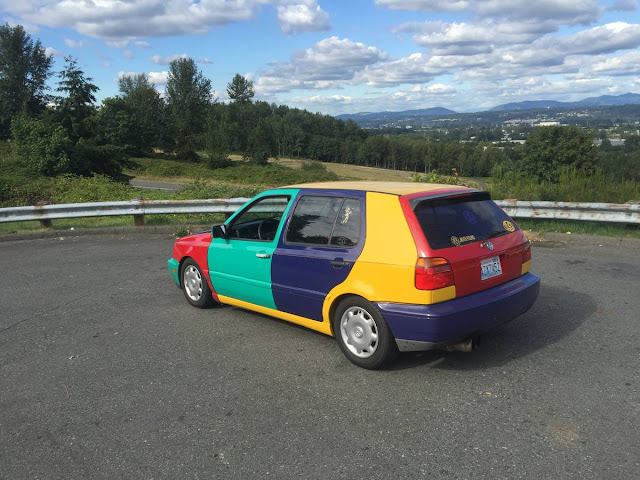 To me, they look out of place with the rest of the car. Finding some Recaros and a few yards of Alpina upholstery would be an improvement. Alpina also made the B1 2.8 which was one of these with a 218hp M30. Drifty! Sorry to get so nerdy. Again, great find! Hi Jay. Not nerdy, "informative", especially the info about gearbox swaps. Thanks. Hmmm, "Bokeh". I just thought that was shallow depth of field. Now even my photographic knowledge is obsolete. Anyway, where I come from, they say "If it ain't bokeh, don't fix it". I'm pretty sure "foreground and background out of focus" = "shallow depth of field". I believe bokeh refers specifically to the circular anomalies that happen around discrete points of light -- not just the generally a sharp (narrow?) depth of focus subject. Read KBZ's link for the difference between background blur and bokeh.